A collection of short stories with the central theme of video games. Stories are written by a combination of fiction authors and video game story writers. One of the things I love about anthologies is that I get introduced to new authors. After reading this anthology, I a large number books to my wishlist by almost every single author in this collection. The wide range of genres represented in this anthology (yes, they're not all sci-fi!) makes it feel like a great stepping stone to the types of books I wouldn't normally read. There were love stories, horror stories, mysteries and dramas. One of the scarier stories actually really freaked me out and I had put the book down for a while to fully recover. 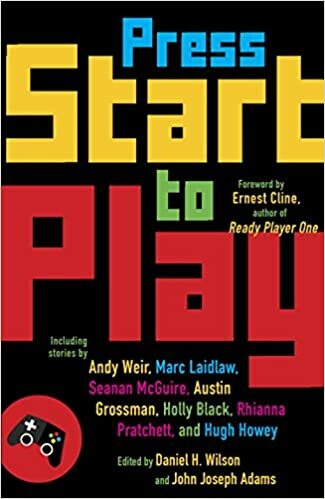 I know that one of the biggest draws people will probably have to this book is that one story is by Andy Weir (The Martian) and the foreword is by Ernest Cline (Ready Player One). Fortunately for the readers, every story in this book is entertaining, engaging, and well worth the money. This is a book that I would take with me to a desert island because of its re-readability. Even if you don't have a strong interest in gaming in general, I feel that there are plenty of stories in this collection that focused more on drama, love, humor, horror, etc. that you will find something you enjoy. Or, if you're trying to get a gamer to do some more reading, this may be a good book for them. Features | 5 Funny Books.